This kit will prove to be invaluable in helping to maintain durometer read-out accuracy for scientific, manufacturing, and research and development use. As a reference check, it will indicate if a durometer is operating within tolerances. 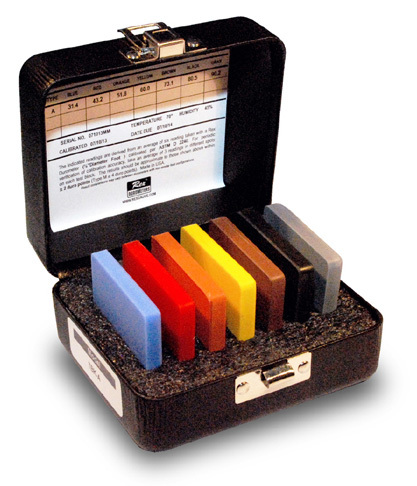 "A" scale consists of 7 color-coded rubber test blocks of various Type A durometer hardness values ranging from 30 durometer to 90 durometer, and are housed in a convenient, rigid, custom-fit protective box. "D" scale consists of 3 test blocks ranging from 20 to 80 durometer. Instant identification of a particular hardness range is made fast and easy because of our advanced color identification. While these test blocks are a convenient form of comparative verification, they are not intended to be used for the purpose of durometer calibration. Rather, they are a form of “quick reference” to the operational status of the durometer being used. A large variation would indicate the need for recalibration of the durometer being utilized. This should be done in accordance with the methods indicated in ASTM D2240. 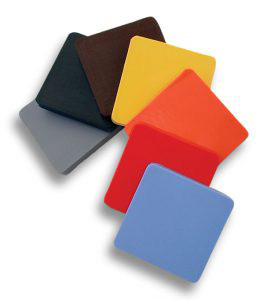 The material (rubber) from which the test blocks are made is fairly stable, however, it is strongly recommended that calibration of these test blocks be verified annually. Size of each Test Block Approx. : 2" x 2"
Thickness of each Test Block: .250"
Size of Fitted Case: 5.5" x 4.687" x 2.562"
Black with magnetic lid latch; fitted poly insert. Actual durometer readings of each block provided on attached panel inside case lid.